At the core of the Apache SubversionTM system is the repository, which is the central store of this system's data. The repository usually stores information in the form of a filesystem tree — a hierarchy of files and directories. 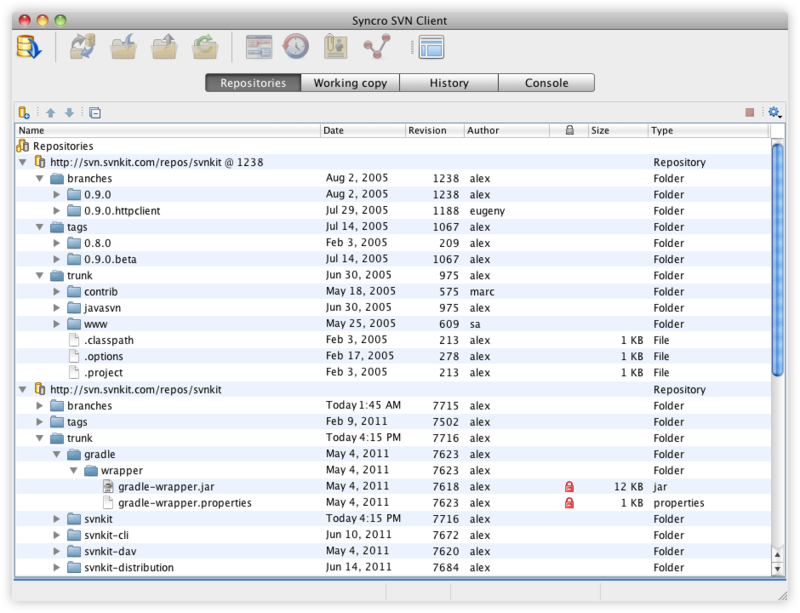 The Repositories view allows you to define, manage and browse Subversion repository locations. Resources inside each repository are presented in a filesystem-like layout, having the repository locations at the first level, where each location represents a connection to a specific repository. Information about each directory or file is displayed in a tabular form. Syncro SVN Client offers support for Subversion 1.4, 1.5, 1.6, 1.7, and 1.8 repositories.